Chalkboards can be considered a thing of the past; that it has been replaced with the less dusty but more costly whiteboards. Chalkboards used to be the main medium of instruction in schools since it is large enough to be seen by an entire class, including those pupils sitting at the end of the classroom. Though chalkboards are easy to make and chalks can be bought almost anywhere for a cheap price, the only downside is that they are dusty, especially when erasing the writings on the board. In addition, there are people who are actually allergic to chalk dust. On this page, we have invitation card designs for various occasions. All of these are done in chalkboard designs, bringing back school-related memories for those who have came across actual chalkboards. For those who have only encountered whiteboards, seeing chalkboard designs may be something new and its uniqueness will always stand out from those we commonly see everyday. Go ahead, check out the invitation designs yourself. 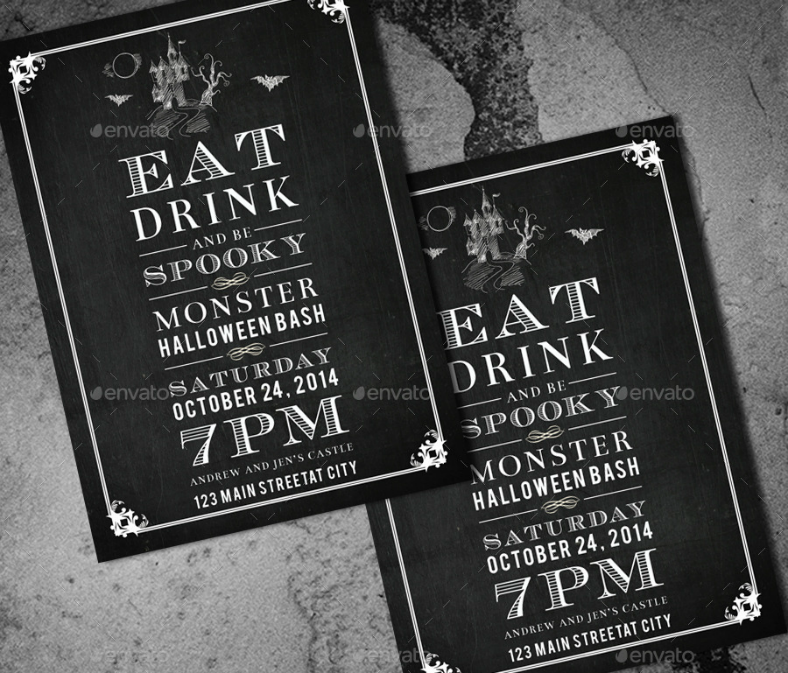 Impress the people who you want to invite to your memorable event with this invitation design. Just like the chalkboards we used to see in school—ones filled with a lot of writings from the teacher—this one is full of writings as well. Most of the text on this design are actually about a wedding. The names of the groom and bride, the date and time of the wedding are included, with a few things added to make it look like a genuine recipe guide. Download this design for a very unique approach to your wedding invitations. Make your birthday invitation straightforward and clean, but also eye-catching with this chalkboard-inspired design. You don’t really need to go over-the-top when it comes to invitations, what’s important is that your invitation is presentable and is able to provide the invitee with the necessary information regarding the event. On the sample above, the most relevant details shown include the name of the celebrant, the date of the event, the venue where the celebration will be held, and the motif or theme of the event. If you want a simple but colorful chalkboard birthday invitation, then don’t hesitate to download this design. If you think formal invitations are only prepared for the wedding event itself, then you are wrong. While not a lot of people are aware, but there is actually such a thing as wedding rehearsal invitations. 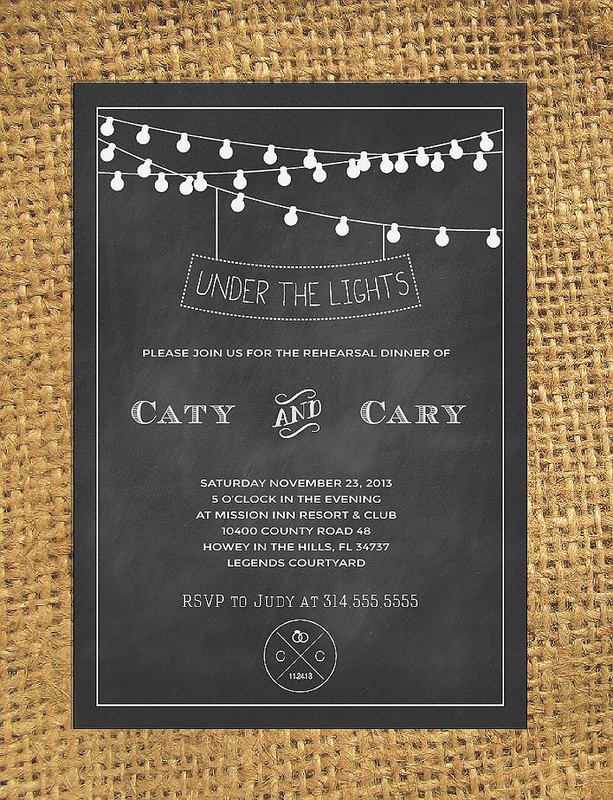 So if you’re planning on having a rehearsal run for a wedding, and it doesn’t have to be YOUR wedding, then we encourage you to download this wedding rehearsal invitation design inspired by a chalkboard theme. On the top portion of this design is an illustration of a series of light bulbs with a small banner under it that says “Under the Lights”, which can be considered as the title or theme of the event. If you’re hosting a bridal shower for a friend, a sister, or someone close to you, make that event much more memorable by inviting a lot of people to come, especially those who are very close to the bride-to-be. 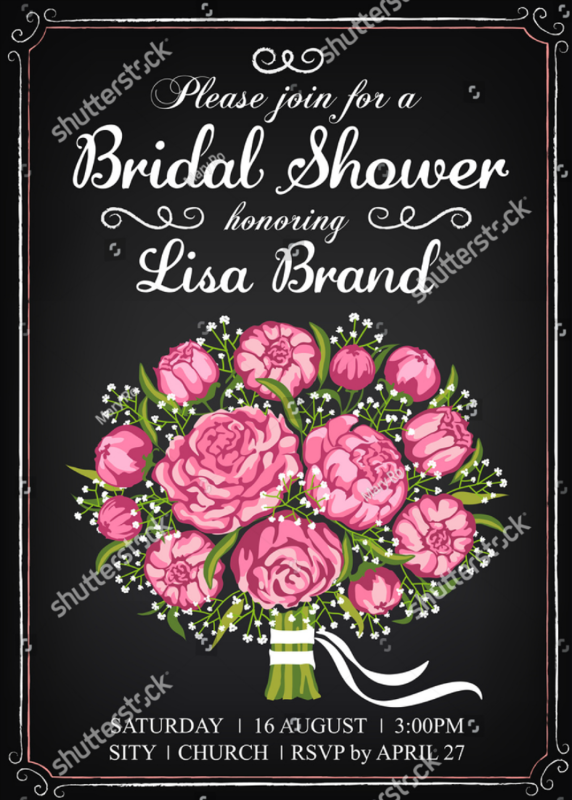 The main attraction of this bridal shower invitation is the bouquet of pink roses in the middle portion of the design, which is impossible to miss because of its large size. 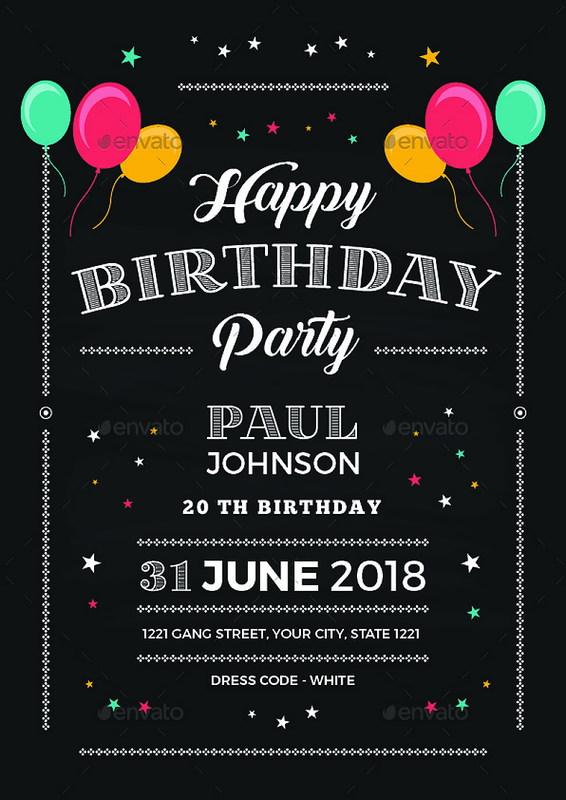 This design puts a limit on the graphics and text by compressing them in the middle area only, and the sides are kept blank to make the invitation look neat, with some added ornate borders for an elegant effect. Baby showers are those events held to celebrate a woman’s road to motherhood as well as the future addition of a member in the family. Baby showers will always be an exciting celebration since it is also during this event that the gender of the baby will be revealed to the attendees. For you to gather your desired number of attendees, you will need to make an attractive and informative invitation for them. 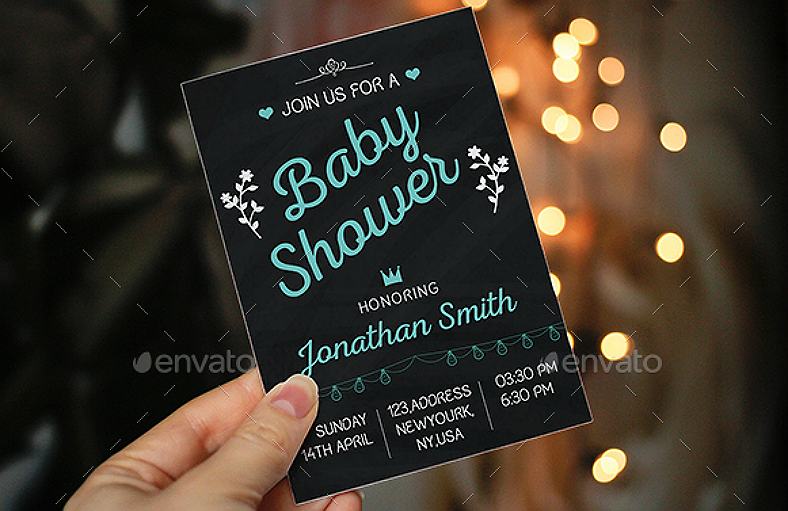 Fortunately for you, we have a baby shower invitation design that you can download, and this one’s in a chalkboard-style as well, so don’t miss this chance! Get it now! 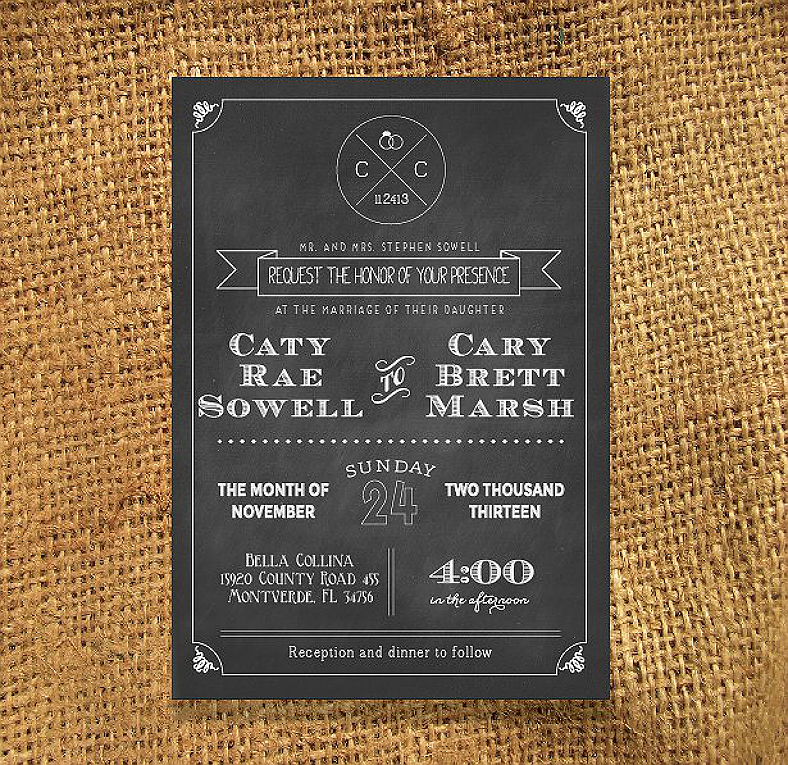 Invite people to eat, drink, and be merry with this chalkboard-inspired invitation design. You’ll never have to worry about not being able to gather up your desired attendees. This event invitation design contains a backdrop with plant illustrations done using colored chalks, and the foreground contains the text all written using white chalk. The uneven texture on the typography makes the design look like it was genuinely written using a chalk. The heading of this design is catchy enough to effectively capture the attention of the reader. The relevant details are then indicated on the bottom half of the design. Take note that on the bottom-most portion of the design is an RSVP line where you may indicate the deadline for the invitee to provide you with a response. If you don’t think this wedding invitation design is appealing enough, then we don’t know what is. Just take a look at this design: the circle shape with a heart as its negative space is already enough to make it eye-catching. 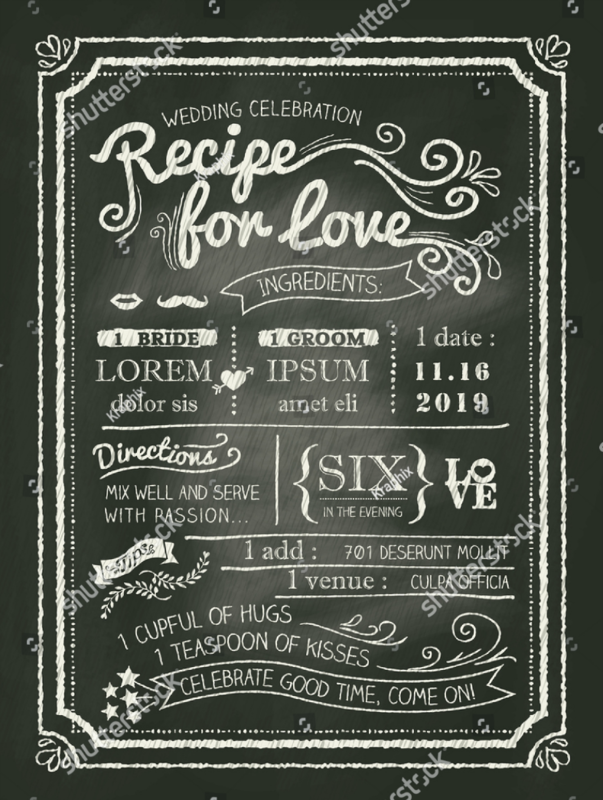 This formal invitation design has been made to look like it was written on a chalkboard, which gives the reader a vintage feel because chalkboards are already considered as vintage items nowadays. Not much can be seen on this design, except the big heart on the upper portion, which is the main feature here. This is followed by a ribbon in the middle where the names of the couple are written. On the bottom portion of the design is where you can find the date of the wedding, which is written in large text to provide emphasis to it. For the Halloween season, while the children are busy going around the neighborhood for their trick-or-treat activities, you could host a costume party which will be attended by adults, but you can also have one that can be attended by children as well. Though the typography used does not look handwritten on this design, the white font color is made to appear as if it was written with chalk. For added creativity, a chalk illustration of a spooky house is drawn on the top-most portion of the design, and an elegant border is also placed around the edges. 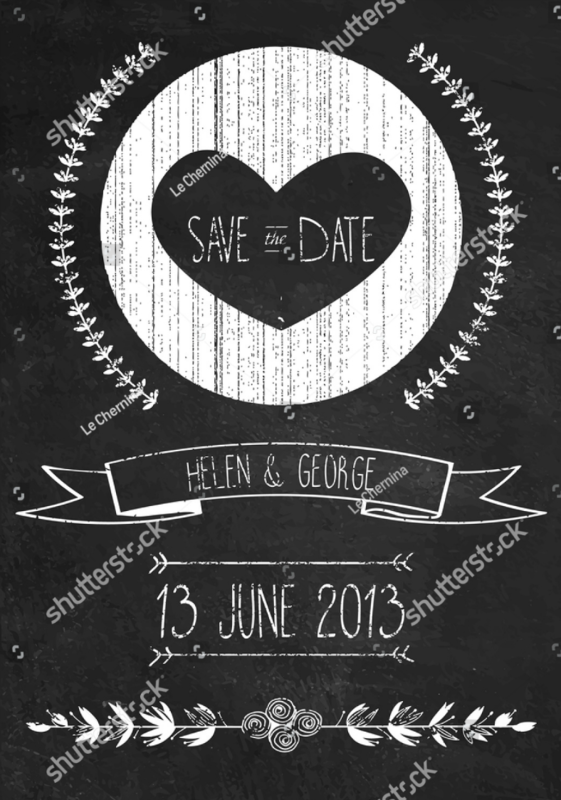 Here’s another chalkboard-inspired wedding ceremony invitation to broaden your choices. On this one, the design is kept simple that it doesn’t have much graphic images except for the creative borders surrounding the main features of the invitation. Starting with the top-most feature, it shows us a logo that summarizes the event. Within the circle is an illustration of two rings to symbolize marriage, the initials of the couple getting married written on the sides, and the date of the wedding written on the bottom area of the circle. Below this logo are the more detailed information about the wedding which includes the venue where the ceremony will be held as well as the time that the wedding will commence. Download this design for a simple yet very informative invitation. 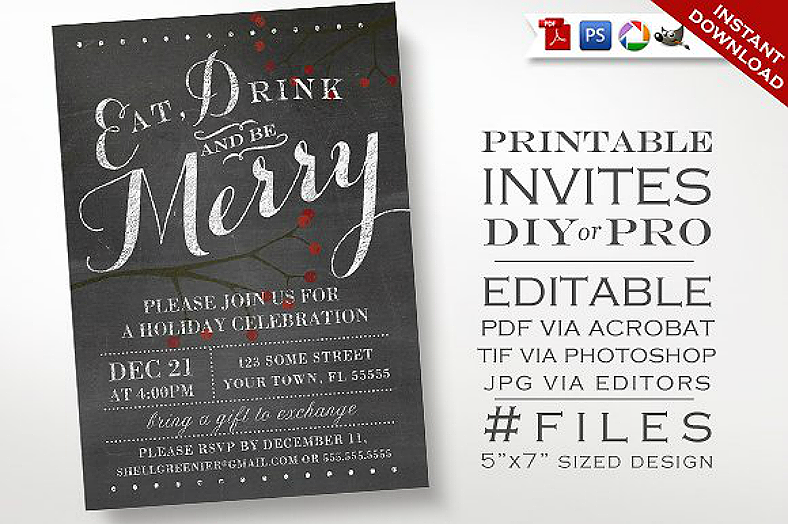 This one is an alternate design to the previous Christmas party invitation that we have shown you. 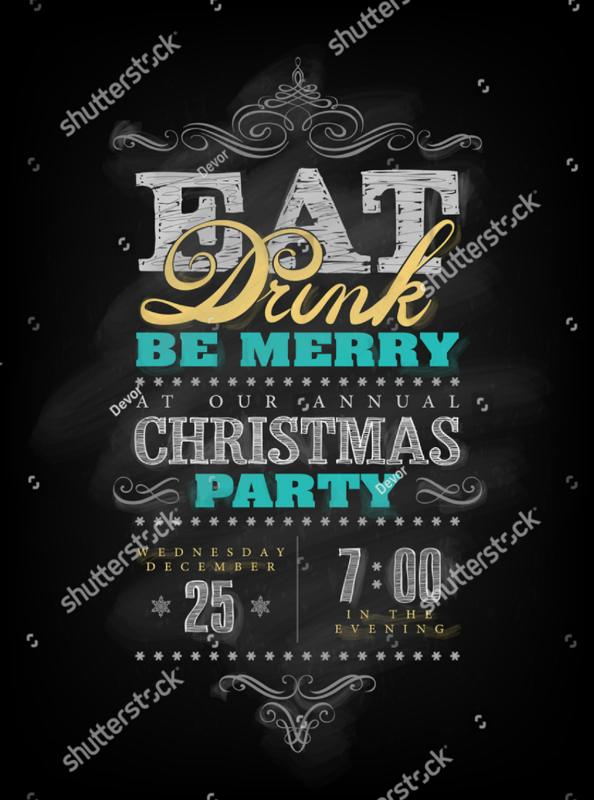 And just like the last one, this one also invites people to eat, drink, and be merry for the Christmas party. The difference with this one is that it focuses more on the typography which is done in a creative and colorful fashion to increase the design’s level of appeal. On this design, you will notice that the date and the time are written in large, bold text. This was done to put emphasis on these important details. A minor enhancement to the design is the presence of smudges or eraser marks to make the chalkboard invitation appear authentic. As you may have known, invitations are important for formality purposes, especially in formal events like weddings. Invitations will also serve as a way for the organizers to limit the number of attending people and to prevent event crashers from attending. The invitation designs here on our website have been gathered from among hundreds of the best ones from various reliable websites. These designs can be downloaded easily and for a reasonable fee, and these are also fully editable to make your editing process easier. If you think these are the designs that you need for the event that you are organizing, So, now that we have shown you a lot already, start downloading your own invitation design.